New barcode scanning technology combined with unlocked smartphones can offer grocers inventory management solutions to improve efficiency and reduce costs. Experts say traditional scanning hardware is not evolving to meet the changing needs of the grocery industry, and that mobile devices are a way to address growing pain points with inventory management. In an industry where most products are perishable or have a limited lifespan, accurate inventory management is absolutely critical. According to the Food Marketing Institute, the average grocery store has only a 1.1 percent profit margin after taxes, and waste can have a big impact on that margin. In addition to weekly cycle counts, grocers should also perform physical counts at least quarterly, according to a white paper by Reliant Inventory Services. Yet wall-to-wall inventory counts can be time-consuming and require great attention to detail. Errors in a physical count can result in excess inventory, out of stock items, incorrect orders and profit loss. One way grocers can improve the efficiency of their physical counts is with higher-performing and more flexible scanning devices. Many grocers are now deploying app-enabled smartphones to scan inventory. Justin Corbell, vice president of sales and business development at Scandit, says rapid advances in processors, cameras and scanning performance have now made smartphones “strong contenders” in the grocery barcode scanning technology space. He says when equipped with a scanning app, smartphones can now exceed the performance of many dedicated scanners. Scandit’s MatrixScan technology enables the user to scan multiple codes in a single sequence. A clerk can quickly wave the device across the shelf and capture all codes in view, significantly reducing the time it takes to conduct an inventory count. “You can hold the device however you want and scan [dozens] of barcodes in seconds, whereas with a traditional scanner it might take minutes,” Corbell says. In an industry where minor improvements in inventory management can make a big difference in the bottom line, smartphone barcode scanning technology offers great value. 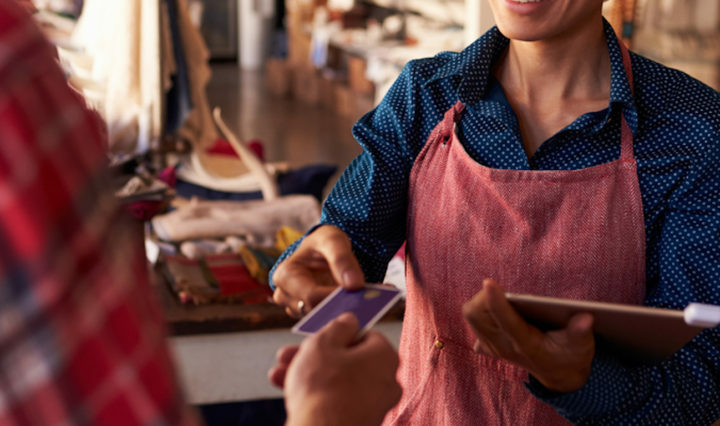 Enabling workers to perform physical counts more efficiently can also reduce labor costs, or allow the retailer to deploy those workers to perform high-value tasks. “Grocery runs on really thin margins, these are volume businesses that need to run super efficiently,” he says. Using smartphones for inventory management solutions also allows for lower costs and requires little training because most people already know how to use them. According to Corbell, VDC Research noted when factoring in hard and soft costs, smartphones can offer up to a 40 percent cost savings over a four-year span. It’s also easier for grocers to scale up and deploy devices during peak seasons. “These consumer off-the-shelf devices have a lower TCO compared to their hardware counterparts … for the same $1,000, you can deploy four for the price of one dedicated device,” he says. Newer smart devices have also now overcome the limitations they’ve faced in the past. Longer battery life and more durability with cases and rigid design make them suitable for the wear and tear of a work environment. An unlocked phone such as the Samsung J7 can easily be equipped with an app for use as a powerful enterprise-grade scanning device. The J7 has a large, long-lasting removable and replaceable battery and its camera can shoot in low light conditions. When equipped with the right case, these devices are durable enough to withstand the rigors of the grocery environment, which can include exposure to moisture and sub-zero temperatures in walk-in freezers. Corbell says smartphones can also offer workers access to more information than they would have in a dedicated scanner. Store associates can use the same device to count inventory, check prices or call a manager.